The FBI is investigating Ohio House Speaker Cliff Rosenberger’s travel and lavish lifestyle. In this video, Rosenberger’s pick for the next speaker, Rep. Ryan Smith, R-Bidwell, weighs in. COLUMBUS – The FBI is investigating the lavish lifestyle of Ohio House Speaker Cliff Rosenberger, from his worldwide travel to his use of a luxury condo in downtown Columbus owned by a GOP donor, several people briefed on the investigation told The Enquirer. The people requested anonymity because the FBI investigation continues. An FBI spokesman declined to confirm or deny the existence of any investigation, although Rosenberger told the Dayton Daily News he had hired a criminal attorney because of questions the FBI was asking about him. As the Republican leader of the Ohio House, Rosenberger is one of the most powerful figures in state government. The Clinton County native has made the most of the perks of the office, traveling from Europe to Israel to Los Angeles to Boston on other people’s money, instead of out of his $100,798 salary. Rosenberger is allowed to pay for work-related travel through his campaign fund, the House GOP’s political operation or with a scholarship from an outside group. He must disclose who paid for the travel, and he cannot accept gifts worth more than $75 from an individual donor or lobbyist. He also must not accept the gift of a trip in exchange for a legislative favor. FBI agents are also looking into Rosenberger’s cozy relationship with longtime GOP donor Ginni Ragan. 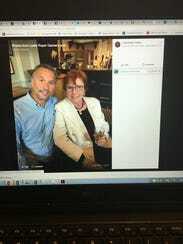 Rosenberger rented from her a luxury condo in downtown Columbus. The speaker did not say how much he paid in rent, and state law doesn’t require he disclose it. Rosenberger, 36, of Clarksville, could not be reached for comment Tuesday. His attorney, Columbus’ David Axelrod, said the Ohio speaker has not been subpoenaed or told he is under investigation. Questions from the FBI may not turn into criminal charges. One trip that is of interest to the FBI: In August, Rosenberger joined five GOP leaders from other states on a four-day trip to London, paid for by the conservative GOPAC Education Fund’s Institute for Leadership Development. Also on the trip: Rep. Nathan Manning, R-North Ridgeville, who attended as a guest of Rosenberger, GOPAC Executive Director Jessica Curtis said. The trip, documented in Facebook photos, included a chance to meet Celia Sandys, the granddaughter of the late British prime minister Winston Churchill. It also included an opportunity for lobbyists to rub shoulders with lawmakers. 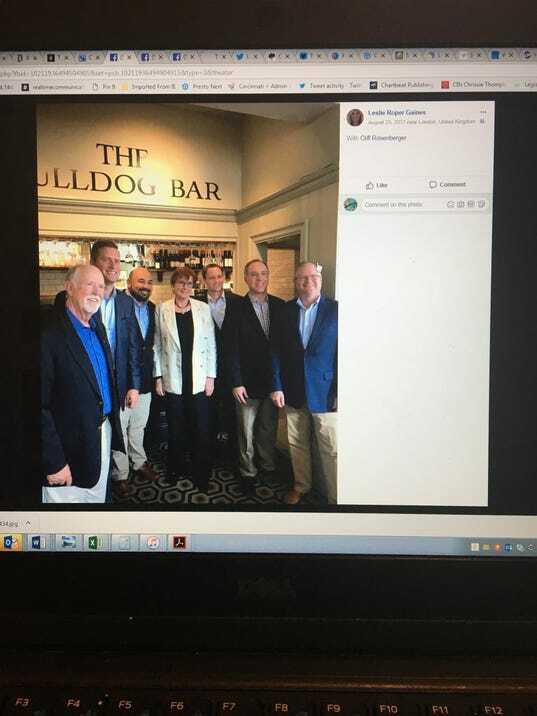 Two lobbyists for title lender LoanMax, Ohio’s Steve Dimon and South Carolina’s Leslie Gaines, are pictured in Facebook photos from the trip. Title and payday lenders have been trying to stall legislation that would restrict that industry. Dimon declined to comment on whether he discussed the legislation with Rosenberger on the trip. Did the FBI ask him about the trip? “You should ask the FBI,” Dimon told The Enquirer Saturday. Dimon and Gaines, linked as business partners and as a couple, have spent time with Rosenberger and other members of the Ohio House all over the country. Gaines’ Facebook page includes photos of Rosenberger in Vermont, in Florida, on a pheasant hunt and at Ohio Stadium. But Gaines is not registered as a lobbyist in Ohio. Both Dimon and Gaines lobby for Select Management Resources, which owns LoanMax. Dimon is registered as a lobbyist for that company in Ohio. Gaines is registered to lobby for the same company in South Carolina. Dimon did not mention the trip to England on any state forms – a legal omission if he did not pay for any of Rosenberger’s or Manning’s expenses. He also did not report lobbying for Select Management Resources on any bills in the second half of 2017. The company has three other lobbyists in Ohio – Bob Klaffky, Doug Preisse and Ben Kaiser, all of Van Meter, Ashbrook & Associates. All three said they lobbied on two bills for Select Management Resources in the fourth quarter of 2017. Lobbyists registered in Ohio don’t have to report their own travel expenses, said Tony Bledsoe, the inspector general for the Ohio Legislature. But they do have to report all bills they discussed with lawmakers. They also must report all food they bought for a lawmaker and any gifts, entertainment or travel worth more than $25 they purchased for legislators. How did Dimon and Gaines get on the trip with Rosenberger and the other lawmakers? When asked who went on the trip besides the lawmakers, Curtis said GOPAC did not disclose its donors, as allowed by the IRS for 501(c)(4) nonprofits. Neither Dimon nor Gaines responded to requests for comment Tuesday. Also of interest to the FBI: Rosenberger’s living arrangements in Columbus. Ragan, the donor who owns the downtown Columbus condo he rented, has given $1.7 million to GOP politicians’ campaigns – most of them members of the Ohio House – since 2012. Nearly $47,000 has gone to Rosenberger’s campaign. Ragan, 73, of Columbus has advocated for years for the elderly and those with Alzheimer’s disease. Gov. John Kasich appointed Ragan to the Ohio Advisory Council for Aging. Her passion for helping those with Alzheimer’s arose after her father, the late Greif Inc. Chairman John Dempsey, developed the disease. Ragan is a top shareholder in Greif, a Delaware, Ohio, industrial packaging manufacturer, and her son serves on the company’s board. Ragan could not be reached for comment Tuesday.